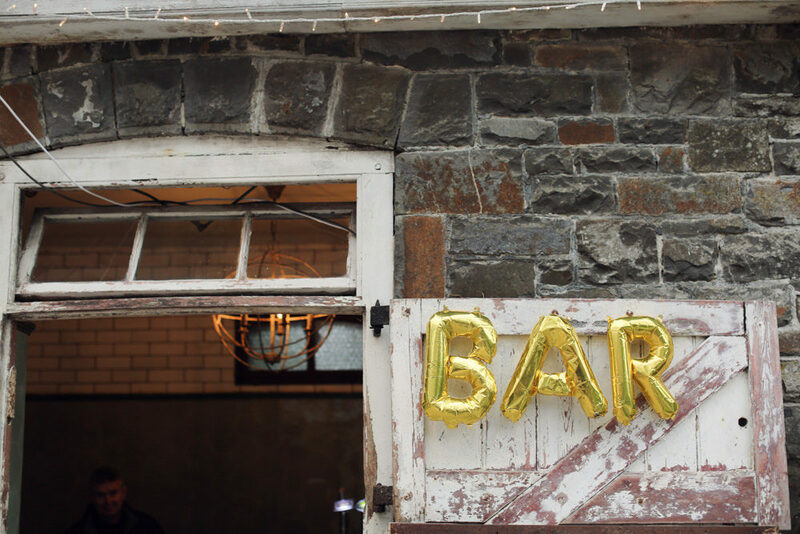 Emma & James’ big day is so beautifully styled, they’ve made the old stables at Love Lust List recommended venue Plas Dinam look incredible – in fact, they look like should always be filled with trestle tables, foliage, white paper cranes and hops (which I’m particularly loving, as the smell must have been delicious). Emma the Bride: I had never been a fan of “weddingy” dresses. I knew I didn’t want white but still wanted to look special. For years I’d dreamt about having a Jenny Packham dress but I never thought I would be able to afford one, so I started shopping for something more affordable. I noticed there was a sample sale in Blackburn Bridal, which is just down the road from where I live in south-east London, and booked an appointment. 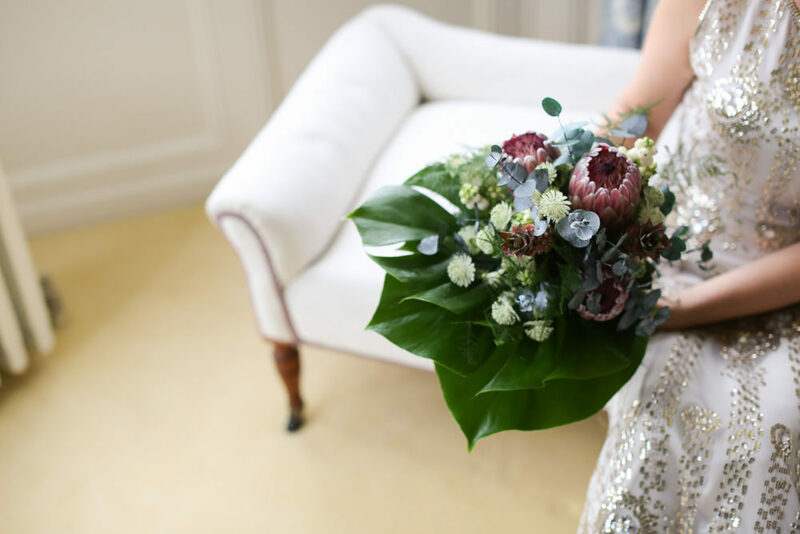 As soon as I walked in I said, to my Chief Bridesmaid, Jesenia, “There’s a Jenny Packham! It definitely won’t be in the sale”. But it was! My decision was made. After I bought the dress I had £20 left in my overdraft which I spent on cheese and wine in the bar next-door. 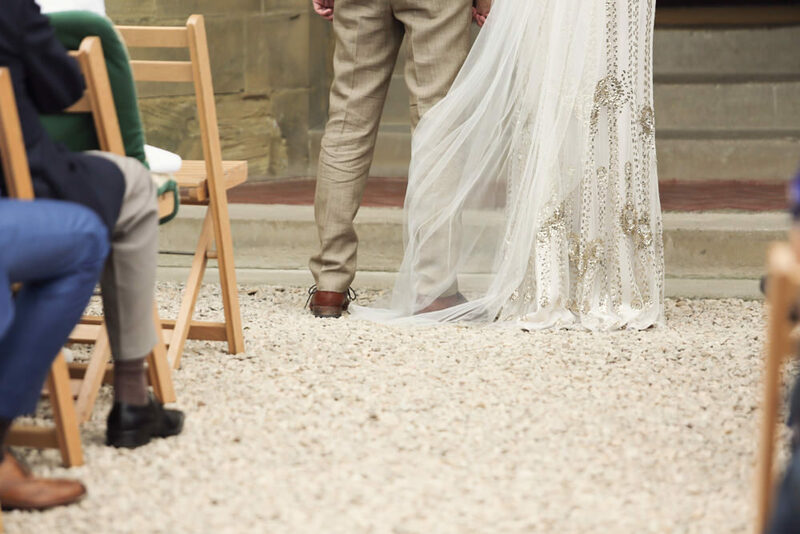 My veil was from Britten and my headpiece was a last-minute buy from WaxFlower Vintage on Etsy. Jesenia was a superstar and did my hair and the bridesmaids’ hair on the day. She also helped me with my make-up. Being only 5’2 I wanted BIG heels but I also wanted them to be comfortable enough to wear until I went to bed. I didn’t want to spend too much money on my shoes because I’d already blown all of my money on the dress. I knew Clarks shoes would be comfortable and affordable. I managed to find a discontinued style in my size online. I ordered navy blue to match the bridesmaids’ dresses. The bridesmaids’ dresses were from ASOS, Elise Ryan, VLabel London (www.vlabellondon.com) and Kaliko. My four ladies had different body shapes and I wanted everyone to be comfortable and happy. After a bit of trial and error we ended up with different long styles in navy blue. The dresses suited each of my bridesmaids so well and they all looked beautiful. James didn’t want a traditional wedding suit which pleased me! I suggested he get a brown/tweed style suit to coordinate with my dress. James found a suit in John Lewis that looked like tweed but was a cotton and linen mix so it would be cooler in warm weather. He ordered it online about a month before the wedding. Luckily it fitted perfectly! The groomsmen wore tweed ties that I bought and their own navy blue suits. My colleague and friend, Jean Willmott, who is RHS trained, did the flowers as a wedding present. Two days before the wedding I got up at 5am to go to New Covent Garden! We picked all the flowers and foliage up and Jean worked her magic (Jean doesn’t have a website but her email is giraffesneck@aol.com). After looking online at stationery I couldn’t really see anything I liked within our budget. I am a bit of a closet artist so I designed and illustrated all of our stationery and printed them using various companies online. Venue I’m originally from Shropshire and wanted to get married close to home. 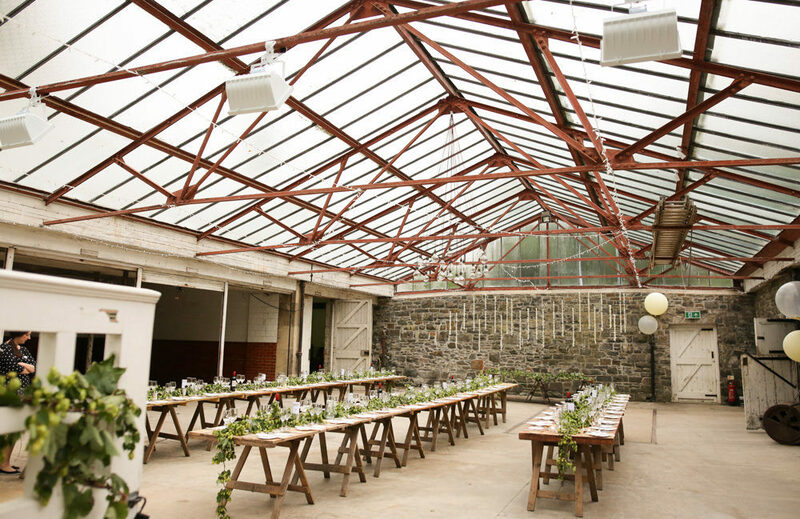 We booked the first venue we saw, Plas Dinam. There was no competition. The house has 15 bedrooms so the bridal party were able to stay with us for the weekend. On the day, we were lucky enough that the rain held off just long enough to hold the ceremony (legally!) outside the house – in fact it started raining just as we signed the register! 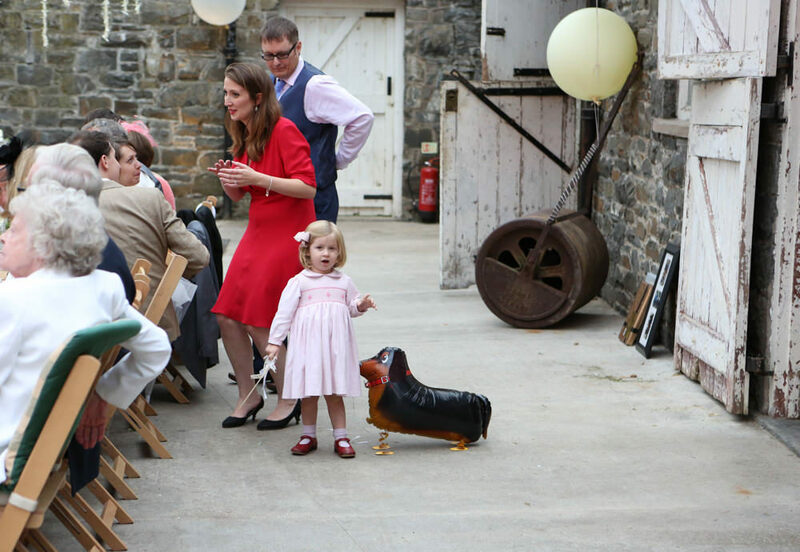 Our reception was held in the Old Stables in the grounds which was originally built as a car garage but is now home to Plas Dinam’s Shetland Ponies in the colder months. Anyone who knows me knows I have an obsession with tiles and the Old Stables has some pretty superb pieces of geometric ceramic on the walls. I wanted everything to look rustic/industrial but not twee. The fact we had the venue for a couple of days before the ceremony gave us lots of decorating time. My bridesmaids helped set the tables – I had ordered traditional Japanese origami paper and instructions along with Studio Ghibli colouring-in sheets for the children. On the night before the wedding I managed to get a small production line going so we could get the paper cranes onto fishing wire (a little wine helped). One of our friends, Gemma, then climbed a ladder and hung all of them up in the stables about 10pm! 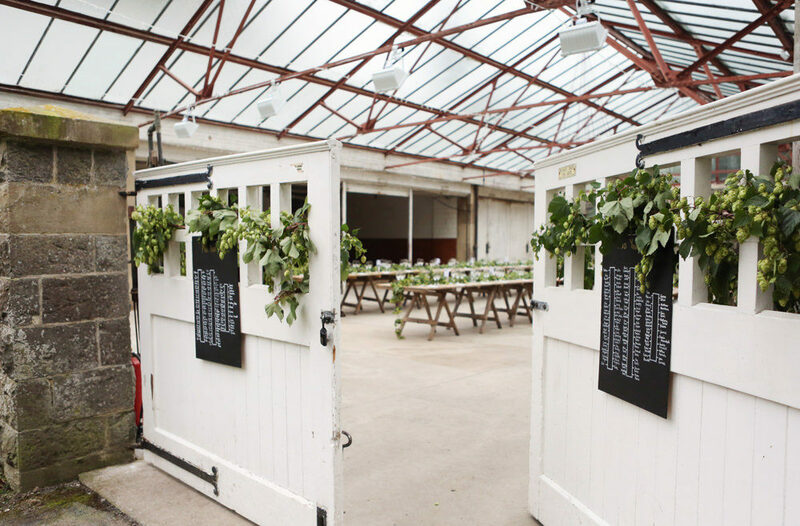 I’d ordered fresh hops from Hop Garland to run down the centre of the long tables. The owner, Lesley, had arranged special delivery for the Saturday however when I tracked the package the estimated delivery date was a few days after the wedding! After a few phone calls and a lot of panic Lesley very kindly cut some more hops and drove two hours so she could personally deliver them on time. She included a couple of extra garlands for us so we were able to decorate the stable doors. Our food was provided by Fingers and Forks which was recommended by Eldrydd of Plas Dinam. Shirley runs a very smooth operation and was especially good at making sure our older guests were happy. We are lucky to have Megan of Blossom & Crumb living just a few minutes down the road. 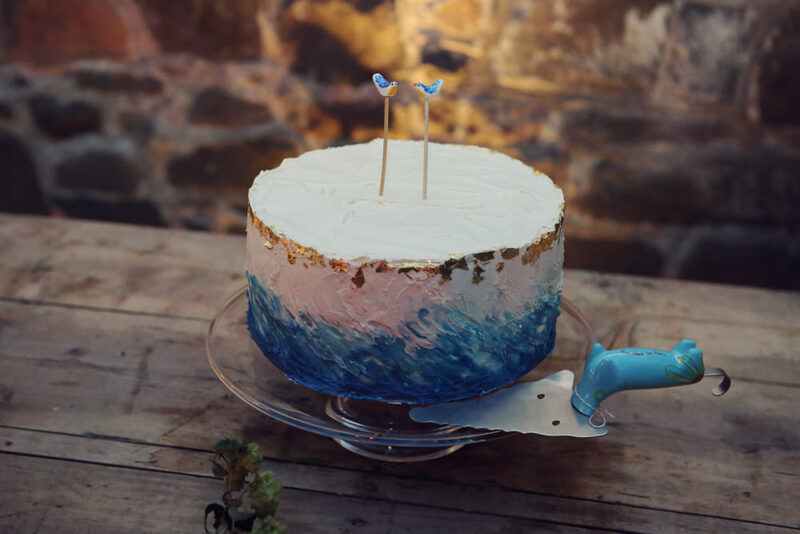 We decided on a red velvet cake coated in ganache, which travelled 226 miles to Wales with us, underneath my legs. We are not the most photogenic people and both tend to freeze when a lens is pointed in our direction, so we weren’t sure about having a photographer on the day. 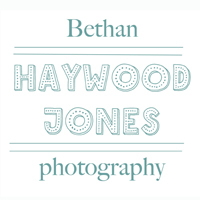 When we’d finally decided we’d go for it, I found Bethan & John of Haywood Jones Photography via the RMW Love Lust List and really liked the style of photography. Bethan is so lovely, she and John immediately put us at ease and we never once felt like they were intrusive. We’ve ended up with some beautiful photos too so I’m really pleased we went with Haywood Jones. I was adamant I didn’t want a DJ at our wedding. We would both be really stroppy if we had to listen to songs we didn’t like. Then, during one of my many afternoons of searching for wedding suppliers, I came across Deckheds. I decided we had to have a DJ and it had to be them. Not only do Karl & Kate have excellent taste in music they also have a sense of humour (they definitely understood what I meant when I said, “play anything Alan Partridge might listen to in his car”). 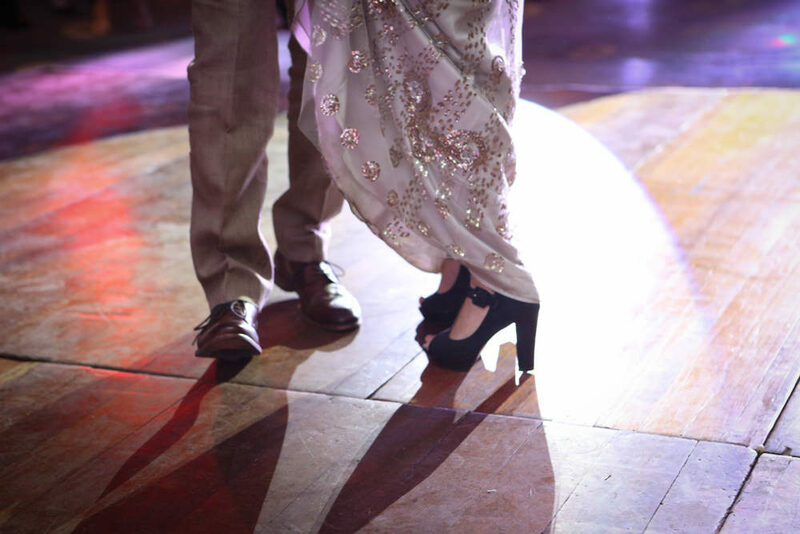 The dancefloor wasn’t empty once during the entire evening. We saw members of our family dancing who we’d never seen dance before and even James’s 91-year-old Gran couldn’t resist having a bit of a bop to The Strokes. At one point there was a conga to The Smiths! Needless to say I didn’t keep my shoes on until the end of the night. Wow, some amazing pictures! I hope they both had an amazing day. It’s been beautifully captured, and the content that you’ve produced is simply fantastic! 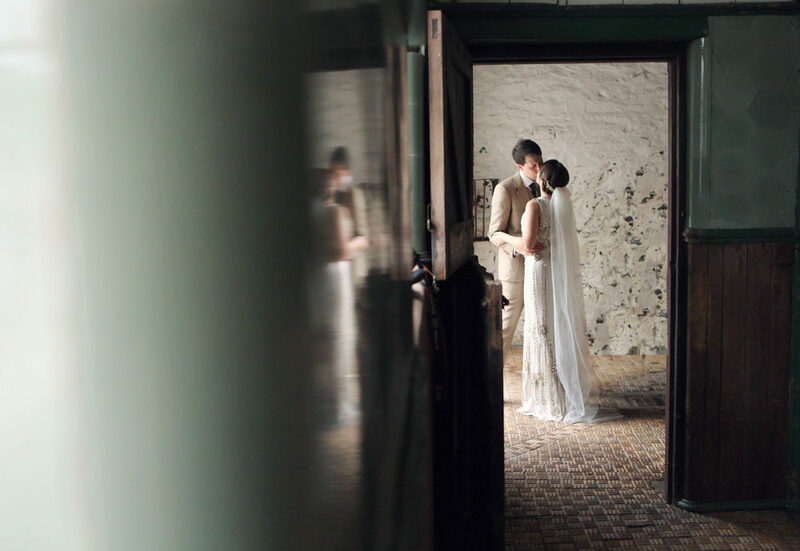 Gorgeous photos of a superb wedding, well done Bethan. 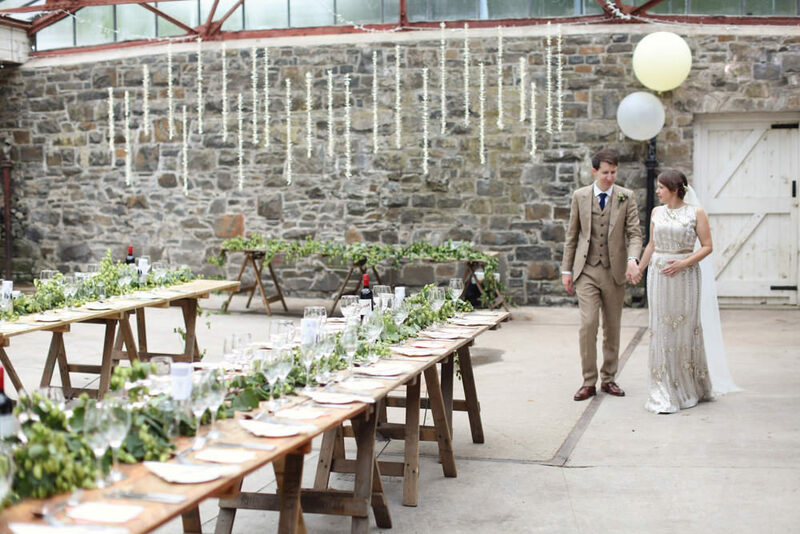 We are thrilled to see Plas Dinam featured on the prestigious Rock My Wedding!